Over a five month period — August to December 2010 — I conducted field research in Singapore where I interviewed 40 South Asian migrant workers engaged in both skilled and unskilled work, three senior executives from the construction industry (a major sector that employs unskilled foreign workers), an executive from the Singapore Construction Workers Association (SCAL), an organisation responsible for ensuring that industry best practices are observed, and 20 Singapore citizens of various ethnic descent. The conversations traversed diverse issues and concerns including work conditions, personal afflictions, life in Singapore, institutional practices with regards to work and welfare, migrancy, racism, Singapore national culture and, most significantly for this paper, cinema. Specifically, the field research sought to explore the ways in which cinema is implicated within a specific sociality, that is, how it intertwines and is entangled with the everyday lives of South Asian migrant workers. The South Asian migrant worker is a broad category: it includes skilled and unskilled individuals largely from parts of India and Bangladesh who arrive in Singapore under distinctive visa conditions, have varying levels of income, and participate in everyday life in Singapore in different ways. Of significance for my study is the fact that the encounters of South Asian migrant workers with cinema differ significantly in terms of platform of consumption. For instance, a majority of unskilled workers claimed that they do not consume cinema through new media platforms or through mobile technologies, unlike skilled migrant workers; similarly a number of skilled workers acknowledged that Indian television channels such as Zee TV, Sun TV, Vijay TV, available through subscription to the cable television network in Singapore, were significant platforms for consuming cinema while unskilled migrant workers declared that they relied on VCD/DVDs and the national free-to-air television service which includes a dedicated ‘Indian’ station — Vasantham (Spring, in Tamil)— to watch films. The field research shored up a complex assemblage of encounters, attachments, connections, and dispositions operating at the interface of cinema and South Asian migrant workers in Singapore. As there are too many of them to chart here, I focus on one specific sociality, non-professional Tamil migrant workers from South India and three cinematic interfaces — the remaking of Rex Cinemas, cinema and transnational social relations, and cinema as a biopolitical tool — that collectively demonstrate that screen encounters are part of a larger assemblage of things, objects, subjects, events and discourses that ‘open up’ the cinematic experience; ‘open up’ in the sense of not limiting the cinematic experience to the film text itself and to the sensorial, emotional, affective registers that are part of our filmic experience (Casetti, 2009), but also relating cinema to other modalities of life, technologies, forms of power, everyday practices, “rhythms, intensities, spaces, bodies and temporalities” (Rai 2009, 14). The notion of screen encounters refers to the correlation between what is projected on screen and other forms of experience, and between what is experienced inside the cinema hall and everyday spaces and ways of being of a specific sociality. I also mobilise this term to capture the methodological intervention the argument makes: screen encounters articulate the multiple, complex relationships between scholars and their subjects (films as texts, films in their historical and cultural contexts, and for this paper, films, people and their socialities) that demands that scholars, similarly, embrace multiplicity and look elsewhere (and write ‘otherwise’) so that we move away from and crack patterns of binary thought that preoccupy the discipline of Film Studies (Harbord, 2007). whether gentle or savage, the discourse of film studies bifurcates into oppositional camps where either position is known in advance: either text or context, formalist analysis or interpretive analysis, film or theory, must take priority. The extant schema of binary thought maps out the possibilities, yet the cartography ceases to serve us (2007, 19). The screen encounters I discuss in this paper take up Harbord’s challenge, as does the work of Singh (2003), Vasudevan (2003), and Kennedy (2000), which I discuss later. Collectively, they seek to forge a new cartography for conceptualising the screen encounter. They underscore the limits of the schema — text-context; formalist-interpretive; film-theory — and emphasize the need to rethink the screen encounter beyond the screen itself, as an assemblage that endlessly mutates, spreads and connects with other intensities. The specific sociality of this study is that of non-professional Tamil migrant workers from South India in Singapore, a city that brands itself as cosmopolitan, “economically dynamic, socially cohesive and culturally vibrant” (Yeoh 2004, 2434). The branding of the city-state in these terms by government officials, agencies and the highly regulated mainstream media, however, disavows that the economic dynamism is produced through the labour of migrant workers under exploitative conditions, that social cohesiveness denies the reality of racism and that cultural vibrancy is officially engineered (see van Grunsven, 2011; Yeoh, 2004). While Singapore has a long history of migration and indeed is a city built on migrants, the post-independence period was marked by stricter border controls restricting in-flow migration. This changed radically in the 1980s as the economy shifted “from production and manufacturing to the service and financial sectors, and finally toward technology-related areas. Between 1970 and 1980, the size of the nonresident population doubled, a trend that continued in the 1980s and 1990s” (Yeoh, 2007). Also “the most rapid increase occurred over the last decade; Singapore’s nonresident workforce increased by 170 percent, from 248,000 in 1990 to 670,000 in 2006. [Of this] about 580,000 foreign workers are lower-skilled workers … concentrated in the construction industry; domestic maid services; and in service, manufacturing, and marine industries” (Yeoh, 2007). The discrepancy between the number of skilled and unskilled migrant workers and the over-representation of migrant workers in selected sectors can be attributed to the reluctance of citizens of Singapore to work in “low-skilled jobs that pay low wages” (Yeoh, 2007). In this sense unskilled migrant workers are a necessity, for they take up jobs that are refused but which are central to the branding of the nation as an economically vibrant cosmopolis. As van Grunsven notes, “such immigration was and is perceived by the state as a ‘necessary evil’” (2011, p. 70). The total number of foreign workers has risen to 1.79 million as of 2010, in a country of 4.84 million people and out of this it is estimated that “foreigners from India now form almost a quarter” (Kok and Sim, 2010); of this, a majority are engaged in unskilled labour work. My study focused on the Tamil migrant workers who come from the state of Tamil Nadu, South India. The Tamil migrant labourer is male, recruited to work in Singapore on a two year contract that is renewable for another two years and employed either in the construction, manufacturing or marine industries. He belongs to what Yeoh and Chang (2001) distinguish as “Third World Populations, comprising low-waged immigrants occupying insecure positions in the unskilled or semi-skilled segments” (cited in van Grunsven 2011, 69). Prior to coming to Singapore itself the workers are trapped in a circuit of debt as they have to pay employment agents a commission and the cost of other expenses that are recovered from their salaries. According to Sarkar (2009), “it takes an average construction or shipyard worker nearly two years to pay off these debts”. Typically, they labour on twelve-hour shifts, are required to work overtime, have little or no medical benefits or compensations and work to productivity targets that are prohibitive. My informants told me variously that they earn between 400-600 Singapore dollars a month, while others estimate that unskilled foreign workers earn about US$1 per hour (Sarkar, 2009). Not only are they “not allowed to bring their families to Singapore—not even for visits” they are also “excluded from any possibility of applying for permanent residency or citizenship”; “forbidden to marry Singaporeans”; and “are only allowed to work for the employer and in the occupation as reflected in the work permit and therefore cannot gain access to the local labor market” (Sarkar, 2009). They live in pitiable conditions provided by the employers, either in shacks, squatters and makeshift containers at the work site itself, or in purpose-built dormitories in the industrial belts of the country or in other non-residential areas. Some workers live in “approved off-site housing” — government approved accommodation in public residential areas — while others live in unapproved dormitories. I visited these places during my field research — purpose-built workers dormitories in an industrial belt, homes of migrant workers in residential zones and unregulated workers dormitories in Little India, a place where South Asian migrant workers congregate on Sundays. I found that the conditions of living were atrocious, as most spaces are over-crowded and lack the facilities needed to cater for the large number of people residing there. On their days off, one Sunday a week and if there are no overtime requirements, the Tamil migrant workers mainly visit Little India, a space within Singapore that, as Cronin points out, “aspires to accommodate the whole of Indian reality” (1989, 18). Little India, originally known as Serangoon Road, historically emerged as a focal point for 19th century migrants from the subcontinent, and today remains an ethnically defined place that “is the locus of … Indian everyday and festive culture” and where one “finds … all the necessary artifacts and implements … [to] fully/better participate in being Indian” (Siddique and Purushotam 1982, 82). As Sandhu notes, “the scene [in Little India] could well be in Bombay or Madras” (1993, 781), offering a rich tapestry of the homes the workers had left behind. As one interviewee informed me, “it’s a little bit like Chennai on Sundays”. Here the workers engage in a variety of quotidian practices: meeting friends, timepassing or killing time, receiving letters, settling loans and other commitments, visiting temples, mosques, and shopping centres, purchasing groceries from India, dining, drinking, playing cricket in the open park and watching a film at Rex Cinemas or at the monthly open-air screening there. Rex Cinemas was built in the 1940s and used to show mainly Hollywood, Hong Kong, Malay and the occasional Tamil film. The Shaw Organisation, a major film distribution company, ran it until it was closed in 1983. Since 1983 it has been converted to an ice-skating rink, a church later on, a nightclub after that before it was reopened in 2008 and now mainly screens the latest films from Tollywood and Bollywood (the Tamil and Hindi film industries). 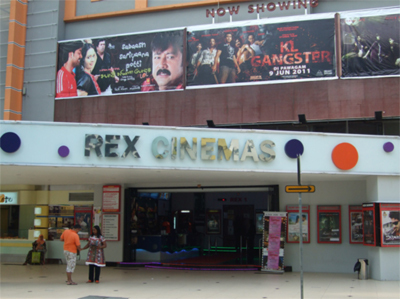 The refurbishment and rebranding of Rex Cinemas was carried out by two industrialists of Indian descent from Singapore and Malaysia who envisaged the opportunity to provide ethnic-specific entertainment to an Indian migrant community that comes from one of the largest film producing and consuming territories. takes into consideration vectors of direction, velocities, and time variables. Thus space is composed of intersections of mobile elements. It is in a sense actuated by the ensemble of movements that orient it, situate it, temporalise it, and make it function in a polyvalent unity of conflictual programs and contractual proximities. … In contradistinction to the place, it has thus none of the univocity or stability of a “proper” (1984, 117). Cinema as place (or the place of cinema) is an ordered configuration of positions defined by specific discursive regimes. The three screen multiplex structure of Rex Cinemas, the 800 patron capacity, the state of the art technologies, a foyer flanked by a ticket-booth and a snack stall that herds viewers straight to the screening halls, the presence of attendants who perform the role of discursive regulators reminding spectators what can and cannot be done within the place of cinema, the car park behind the multiplex, and the practices of spectators inside the auditorium, all work in consort — everything is in place to produce an ordered, filmic experience. The place of cinema thus implies stability or fixity. This is precisely how the entrepreneurs and urban planners involved with Rex Cinemas envisaged it: a place that provided an ordered, proper, organised and comfortable cinema experience. The workers however reconfigure the place of cinema into space: they do not see the films, they congregate outside Rex Cinemas to meet up and have a chat, sit idly in the carpark talking about the latest films, home, personal triumphs and grievances over a beer or two, gather at the foyer around advertisements of the latest films chatting about the stars, plots, and sharing reviews (specifically amongst those who have seen the films on DVD/VCD). This reconfiguration of Rex Cinemas challenges and remakes the ordered place of cinema, transforming it into a space that emerges through the practices of migrant workers. Many of the workers constantly evoked the phrase ‘timepass’ to capture the reconfiguration of cinema place to space. In other words, ‘timepass’ was used to apprehend those practices I outlined above (chatting at the cinema carpark, using Rex Cinemas as a meeting point to catch up with friends, checking out film advertisements, just simply chilling out). “The expressive Indian English word ‘timepass’ means ‘killing time’ or an activity to do so. It is a fairly recent coinage, which first appeared in academic publications reporting research done in the 1990s” (Fuller, 2011). Studies on and about timepass (Jeffrey, 2010; Abraham, 2002; Rajagopal, 2001; Chakrabarty, 1999) demonstrate that it is a rich, complex and loaded term that captures a variety of pleasurable, unproductive, aimless expenditures: hanging out at the mall, chilling out at the tea-shop, congregating around the corner of the street or house, watching television, chatting to friends, or going to the cinema are examples of timepassing (Jeffrey, 2010). As Fuller (2011) points out, “the word generally carries the connotation that the activity, even if harmless, is neither serious nor productive”. This, however, is debatable — as I have argued the workers’ timepassing remakes the place of cinema into space and this is serious business, for these practices can be conceived as tactics that subvert the strategies of Rex Cinemas, that is: ideas about specific objectives (to capitalize on the increase in South Asian migrants) and means of achieving this (the redevelopment of Rex Cinemas, the structure of the foyer, use of multi-screens, seating capacities, auditorium size, and so on). Timepassing at Rex Cinemas thus is a “guileful ruse” (de Certeau 1984, 37). Additionally, timepassing at Rex Cinemas reminds us that this practice is closely connected to the workers’ labour conditions, wages, and margins of exploitation. This, also, is serious business — the workers timepass at Rex Cinemas because they cannot afford to watch the films, underscoring the abject conditions under which they have migrated for work. For, as Lefebvre reminds us, the remaking of cinema place into space is connected to “the forces of production (and with the relations of production)” (1991, 77). The remaking of Rex Cinemas is connected to what Marx calls the means of production and labour power, and the economic ownership of productive forces that underlie the capitalist mode of production. This is precisely how we might capture the responses from the Tamil migrant workers, detailing why they do not see films at Rex Cinemas; for the remaking of cinema place into space is connected to their conditions of work. At the same time, the responses, which conjure the term timepass, foster a sense of solidarity built on shared conditions of employment and migrancy. As Jeffrey in his study of unemployed middle class youth in Meerut, North India suggests, “discourses of timepass acted as a type of ‘structure of feeling’ in Raymond William’s (1977) sense of a social consciousness that gives a distinct form to people’s actions and sense of their place in the world” (2010, 470). In other words it fosters a sense of identity and solidarity through affective connections. The workers I spoke to mentioned that timepassing at Rex Cinemas was used to convey and share stories about their respective work and living conditions, financial difficulties, news from their village/city, workers’ rights, employment laws in Singapore, better work opportunities, latest films, music and celebrity stories, personal stories and so on. It also prominently featured banter, jokes and vetti pecchu (idle talk). The conversations therefore traverse from the mundane to the significant and in the process build a sense of commonality around the shared experiences of migrancy, employment and displacement. As Amit Rai puts it, “forms of bodily and communal security emerg[e] through [the] discursive practices” (2009, 144) of migrant workers. The remaking of Rex Cinemas conveys how the screen encounter itself mutates and spreads, and connects with other events, discourses, and structures. In this instance the workers who use Rex Cinemas as a space for timepassing, displace it as a place of exhibition and consumption of a cultural object. While, as mentioned, a majority of the workers do not visit Rex Cinemas regularly to watch films, they do have a finely tuned and up-to-date knowledge of all the latest films, celebrity news, industrial developments and so on. In terms of consumption patterns, the respondents unanimously remarked that films were watched mainly on “VCD or DVDs because of the cost of cinema tickets”; the reason being, as one respondent commented, “because you could share your DVD and VCDs amongst friends you could watch many films although you only paid for one”. In addition, they told me, “most of the DVD and VCDs we watch are pirated because it was cheaper and affordable”. 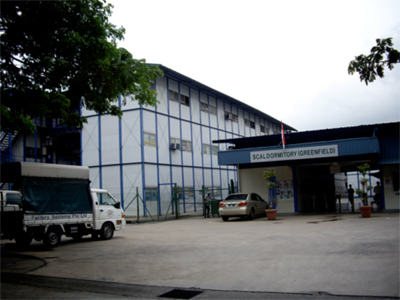 In a highly regulated national media environment, where the state apparatus criminalizes issues around piracy and intellectual property rights, the “secret”, pirated, illegal circuit that the migrant workers are connected to conveys how the screen encounter is mediated by the means of production and labour power. The workers did confess to being cinephiles and watched, on average, six to seven films a week on DVD/VCD and on Vasantham, which regularly screens three Indian movies per week. As one worker pointed out, as of 18 August 2010, when the interview was conducted, he had watched Paiyaa (released 2 April 2010) and Singam (released May 2010) on pirated VCDs. The workers’ admission to being cinephiles can be related to the centrality of film viewing as part of everyday life in India and its place as “the cultural dominant of India”(Mishra 2002, 3). But film-viewing in Singapore by the migrant workers is this and more. In my research a majority of workers I spoke to confirmed that watching films connected them with South India, the capital city Chennai, home, more broadly, and family, relationships, and other intimate connections more specifically. One respondent even said that film watching eased the trauma of displacement, or the crisis of difference. It did so because when they watched films it was always done in a communal setting, with fellow workers. On the one hand, we can understand these responses as affirming cinema as a central force in mediating transnational social relations ruptured through the experience of migration. The building of community through the experience of watching a film together, the sense of belonging created through the screen experience, the reminder of home felt through the films (as one interviewee said, “through the films I find out about recent developments in Chennai”), and the larger affective register that was shared with me reinforces the scholarly arguments that link cinema, film and experiences of migrancy. Here cinema, the filmic experience, is removed from the discomforts of the overcrowded dormitories, squatters and makeshift containers in which the workers live, and connects with multiple affective registers that are part of the migrant workers’ lives. The screen links up with different energies and through this connection the screen is transformed: it is moved out of its location and enters into another environment where it is entangled and entwined with the migrant workers’ affects and transnational social relations, affirming the intimate relationship between cinema and their conditions of displacement. Furthermore, we can also read these responses as retorts to the contemporary unequal flow, distribution and development of capital. That is to say, we can capture these responses to watching films as symptomatic and a consequence of the unequal global distribution of power. The individuals who make up this sociality are, unarguably, deterritorialized subjects. “Deterritorialization [as Arjun Appadurai reminds us] … is one of the central forces of the modern world, since it brings laboring populations into the lower-class sectors and spaces of relatively wealthy societies”, and one of its results has often been to “create an intensified sense of … attachment to the politics of the home state” (1990, 301). As labouring subjects who are compelled to move to economically powerful nations (such as Singapore) to take up work in lower-class sectors where they are open to various forms of social marginalisation, security is sought by fostering an attachment to their sense of home, identity and belonging. We see this manifest variously in the massive gatherings in Little India on Sundays, social groups hanging out in public spaces including cinema complexes, film watching nights in the dormitories, and through the response generated to questions about film consumption. In other words what I am suggesting is that the responses that tell us about the connections with home, culture, community through cinema should be seen as intimately connected to material conditions such as the Singapore government’s project of capital accumulation, the circuit of exploitation of migrant workers to Singapore, the Singapore citizenry’s refusal to work in certain sectors, the low wages for work in these sectors, unequal global flows, and so on. The point here is that the workers’ responses, which capture cinema’s power to produce affective connections and foster, mobilise and disseminate a sense of critical attachment, need to be grounded within material conditions. The screen encounter, cinema itself, and its capacity to reproduce transnational social relations, needs to be connected to other human bodies and thereby marked out through class distinctions, capitalist structures, and unequal economic flows or energies. While unskilled cheap migrant labour is a necessity for the cosmopolis city-state of Singapore, the significant increase in the number of migrant workers has caused social tensions. This discontent with the Government’s liberal policy on foreign workers was reflected in the 2011 General Elections when the ruling party that has been in power since independence in 1963 lost an unprecedented six seats and “its share of the vote fell to an all-time low of 60 percent” (Abbugao 2011). As Rahman observes, “despite the fact that Singapore has an open-door policy for migrant workers … and one in three working persons in Singapore is a foreigner, the level of comfort of the citizenry towards the presence of migrant workers is rather disconcerting” (2010, 208-209). Over the years, numerous reports have appeared in the media of unhappiness amongst … citizens who find it unpleasant having to share their residential space with lower skilled migrant workers. These workers are either renting units in public housing estates or living in dormitories near housing estates and have resorted to colonizing the void-decks of public housing flats to gather after work hours or on Sundays. Citizen dwellers are unhappy with the presence of these workers and have made allegations that they are given to anti-social behaviours such as public drunkenness, rowdiness, fights, and urinating in public, threatening the security and disrupting the peace and harmony of HDB neighbourhoods (Rahman, 2008). On most evenings, there’ll be groups of foreign workers of various nationalities having picnics on grass patches EVERYWHERE. They sit around having food and drinks, and almost always never clear up after they finish, leaving debris all over the place. Sometimes some of them get drunk and get rowdy or even fight with one another. I understand these chaps don’t have many options for entertainment, I try to emphatise [sic] with that, but it gets overboard when they start to make trouble and mess up the place (Mr biao, 2007). On weekends in the Botanic Gardens or in Lucky Plaza [shopping centre], its okay, but meet them downstairs in your void deck, I think many Singaporeans have fears. I know some residents go and see their MP and say, you know, please keep them out of sight … (Prime Minister Lee Hsien Long, cited in Au et al, 2007). Mr. Ali Asraf, 29, a construction worker from Bangladesh, recalls occasions of people refusing to sit next to him on a train and of being yelled at for accidentally bumping into someone (Au et al, 2007). What is going on here is the production of a racialised moral panic that draws on familiar tropes — safety, security, fear, and anxiety of citizens against perceived threats posed by migrant workers. And the construction of a moral panic, as we know, is used in “the enforcement and formation of social policy, law, and societal perceptions of threat” (Rothe and Muzzatti 2004, 328). Moral panic also distorts the event, phenomenon, or discourse “out of all proportion to the actual threat … [and] shift[s] attention from the deviant act … to the relation between the deviant act and the reaction of the public and the control agencies of the act” (Hall et al 1978, 17, emphasis in original). Such a strategy serves to further marginalise migrant workers who are ‘criminalised’ for alleged anti-social practices that threaten the citizens’ way of life and serves to consolidate the hegemony of a specific understanding of Singapore national culture. While the state is implicated in the production of a moral panic, as the Prime Minister’s comment reinforces, it is also cognizant of the need to quell public discontent. And one of the strategies employed to inoculate the racism of the citizens is to use cinema to reduce the visibility and movement of migrant workers. In response to the increasing racism against migrant workers the Singapore government initiated the construction of dormitories away from residential centres. In the margins of suburbia and beside each dormitory the Singapore government, through the SCAL, have built Recreation Centres. I visited one of these, located at 41 Soon Lee Road in the Jurong Industrial area, where I interviewed an executive of SCAL who insisted on absolute anonymity. I should add that I was denied entry into the dormitory for ‘security reasons’ but was welcomed to the Recreation Centre, a place patronized by both migrant workers and the general public, where the interview took place. I was told that “the dorm was opened in 2004 and has about 3000-3500 workers. The majority are Indian, then Bangla, then Chinese and then Thai and Filipinos. We have twelve blocks; each block is three storeys high; there are twelve people per room; each room is 36 square meters and so each person is given three square meters.” The Recreation Centre opened in 2009 and houses a hawker centre, retail shops (mobile phone shops, clinic, and sundry shops that cater to the everyday needs of the workers), a recreation area for basketball, volleyball, and soccer, six barbeque pits, and an open car park space which is converted once a month into an open-air cinema, which screens the latest films from Bollywood, Tollywood, and Hollywood. because we show films in the Dorm everyday the workers don’t go out on weekdays after work, so there is less trouble. You know having the films in the Dorm means that the workers are not so bored. Now they have something to do. … Many workers come and watch the films. Almost every night the space we use for this is full. … We only began showing the films in the Recreation Centre in 2010, around mid-year I think. The idea was M1’s. … Having all this TV and film helps us control the workers, they stay here, go and drink at the Recreation Centre or the Beer Garden at the Dormitory, don’t go out and don’t create trouble for the Singaporeans. You know the Singaporeans are very quick to complain, especially when it comes to foreign workers. It is not surprising that the executive couched the screenings in philanthropic terms: as part of a larger welfare system that compensates for the workers’ sense of displacement and isolation through films. But what is surprising is the admission that these screenings are used to regulate the movement of workers. Screenings serve to curtail the movement of workers into residential spaces where they might go for dinner or a drink at the local coffee-shop, hang out at the suburban malls, Cineplex, park, void-decks of residential apartments (these are public spaces), stroll around the suburb, or timepass in public spaces where they would encounter other individuals who are part of the social milieu (citizen or otherwise). Films are used as one part of a larger discursive assemblage of control that includes beer gardens, retail shops, hawker centres, sporting facilities, and so on that seeks to ensure that the workers are occupied after work so that they are visible within particular places and invisible to other people. is centered not on the body but on life: a technology [of power] which brings together the mass effects characteristic of a population, which tries to control the series of random events that occur in a living mass … This is a technology which aims to establish a sort of homeostasis, not by training individuals, but by achieving an overall equilibrium that protects the security of the whole from internal dangers (1997, 249). Biopower marks a modality of government that is concerned with the population, or more precisely with the strategic management of population. It is underpinned by the “power of regularization … [of] making live and letting die” (Foucault 1997, 247). And this is done by “using overall mechanisms and acting in such a way as to achieve overall states of equilibration or regularity” (246). This new mode of organising the multiplicity of individuals that is the population is what Foucault calls biopower, which seeks to bring “life and its mechanisms into the realm of explicit calculations” (Foucault 1997, p. 143). Biopower seeks to set up and manage social relations to extract maximum potential; it organises the forces of life, determining who can be killed and who should not be in the name of the well-being of the population. Seen in this way, the building of workers dormitories, the daily screenings there, the monthly screenings at the Recreation Centre, and the provision of amenities (food, medical, telecommunication, recreation) are part of a biopolitical strategy that is put in place to tackle and alleviate the discontent of the citizens in the name of the well-being of the larger population. Here, screens are used to ensure that migrant workers are kept within a specific place, under surveillance, managed and marginalised: cinema is redeployed as part of a project of sovereignty engaged in the management of migrant workers’ lives in the name of the well-being of the Singapore citizens. They are part of a larger system of calculating, classifying and objectifying forms of life in ways that ensure the optimisation of the general state of life by perpetuating the very racism of the citizens. In other words, the state’s response (of keeping migrant workers in specific locations and curtailing their movements) entrenches and legitimises the racism of the citizens. Because migrant workers are both a necessity and a problem, the nation-state and companies that employ the workers have resorted to using cinema to calculate, classify, regulate and manage what is conceived as an internal danger that threatens the “overall equilibrium that protects the security of the whole” (Foucault 1997, 249). Cinema spreads, mutates and becomes part of the larger biopolitical project to ensure that the Singapore citizens do not feel threatened by the presence of migrant workers, particularly because the migrant workers’ labouring bodies are central to the national project of building a cosmopolis city-state. What is expressed in these three interfaces reinforces the need to rethink the screen encounter beyond the screen itself, in relation to the connections and entanglements with various structures, organisations, and energies — transnational social relations, biopolitical projects, affective registers, timepass, migrancy, racism, the nation-state’s neoliberal project, telecommunication and construction industries, and other technological platforms. In short the screen encounter is not necessarily only about the film text. Of course the film text matters: the affective connections engendered when the workers watch films or learn of developments in Chennai are testament to the significance of the film text. But this is not all that matters: as the field-based research shows, the screen encounters are not necessarily about the film text and this is a significant point, for it calls for a reconsideration of the screen encounter and connects with a body of work that I will schematically chart by way of a conclusion; a body of work that articulates and forges a new cartography to conceive of the screen encounter. In a 2003 issue of the journal Seminar titled “Unsettling Cinema”, Bhrigupati Singh makes a strong case for reconsidering our approaches to cinema given that cinema “has become radically dispersed”, in terms of contexts of appearance, fluidity of movement between different media technologies, and the superfluous integration with other commodity forms. Further to this suggestion one might also ask, in what ways do people engage with films “within diverse modes of sociality, forms of experience and ways of being in the world” (Singh, 2003). How do our own conditions of life, and our histories, entangle with cinema? The shifts and changes in “shape, form and mode of dispersal” demand that “we shift ‘cinema’ from its conception as a purely textual object to being a socially embedded set of practices. This is a shift away from the fictionality of cinema as a formal ‘text’ towards its fictive quality, its being ‘made up’ as a form on the terrain of life, labour, and language” (Singh, 2003, emphasis in original). let us consider the cinema as a more matter of fact everyday space: composed of the hall, its internal organization of foyer, auditorium, seating and the projected film, and its public presence, as in its façade, advertisements, marquees, hoardings. And let us see space in relation to a broader space, in the market, near factories, schools, office blocks, in a mall, in residential areas; and how it is located in the depth of this space or on its margins, near arterial thoroughfares, linking one space to another through transportation. Let us argue then that the experience inside the hall, and of what is projected onto the screen, is distinctive, for you can’t experience it elsewhere, or through any other medium. But let us also suggest that this experience is … continuous with the space in which it is located (2003, emphasis in original). some of the traditional focuses of cinema studies. These include the interpretation of films in terms of their formal strategies and the way they place spectators in terms of social and political perception; and, more generally, an understanding of the significance of cinema as a technology of modern experience (Vasudevan, 2003). In a book, as in all things, there are lines of articulation or segmentarity, strata and territories; but also lines of flight, movements of deterritorialization and destratification. Comparative rates of flow on these lines produce phenomena of relative slowness and viscosity, or, on the contrary, of acceleration and rupture. All this, lines and measurable speeds constitutes an assemblage. A book is an assemblage of this kind, and as such is unattributable. It is a multiplicity — but we don’t know yet what the multiple entails when it is no longer attributed (1987, 3-4, emphasis in original). The book, for them, is a clustering of discrete parts, it is a multiplicity and not a tightly organized and coherent whole and as such cannot be contained: it leaks, moves, interacts with other spaces, things, peoples, objects, affects, subjects, geographies, cultures, cultural practices and so on. As an assemblage the book can bring together any number of disparate elements. The book itself can be an assemblage — “it is a little [literary] machine”— but this does not prevent it from containing assemblages within itself or entering into new assemblages — with “a war machine, love machine, revolutionary machine, etc” (Deleuze and Guattari 1987, 4). Similarly, conceiving cinema as an assemblage puts it into relationships with spectators, technologies, urban spaces, retail stores, etc., thereby articulating its connections with other multiplicities. Barbara Kennedy’s Deleuze and cinema, published in 2000, arguably sets up the debate in Seminar, where she suggests that for the study of cinema “we need to rethink a post-semiotic space, a post-linguistic space, which provides new ways of understanding the screen experience as a complex web of inter-relationalities. The look is never purely visual, but also tactile, sensory, material and embodied” (2000, 3). Kennedy’s position draws on Elizabeth Grosz’s earlier sentiments where she argues that it is “no longer appropriate to ask what a text means, what it says, what is the structure of its interiority, how to interpret or decipher it. Instead, one must ask what it does, how it connects with other things” (1994, 199). Asking what does a film do, how does cinema connect with other things ruptures the binary schema (text-context; formalist-interpretive; film-theory) that Harbord suggests preoccupies Film Studies because an exploration of connections, links, spreading and mutations, undoes binaries and encourages becomings that result in a multitude of different potentialities of reading cinema. What is offered through these works — Singh (2003), Vasudevan (2003), Kennedy (2000), and Deleuze and Guattari (1987) — is a conceptual cartography for thinking about cinema’s complex entanglement with different socialities, its relationship to the production and consumption of other commodity forms, the ways in which it “blocks, or makes possible other worlds” as Matthew Fuller (2005, 1) puts it, and it calls on us to “attend to the [complex] ways in which people position or embody themselves (or are marked) as bearers of identity within particular social and institutional networks” (Singh, 2003). The field research discussed here complements and reinforces the arguments calling for a reconsideration of how we conceive of the screen encounter. It demonstrates that the screen encounter is sometimes outside cinema, beyond the film-text and as such challenges the established schema that dominates Film Studies. It has been my objective in this essay to articulate the complex relationships between cinema and Tamil migrant workers in Singapore. In general terms my argument reinforces the need to rethink the screen encounter beyond the screen itself, as connected to, as part of, and entangled with other spaces, peoples, structures, and institutions in unattributable ways. More specifically, I have sought to locate cinema as part of a larger assemblage of things, objects, subjects, events and discourses and to thereby argue that cinema specifically, and the filmic experience more generally, is intimately entangled with the nation-state’s project of capital accumulation, a larger circuit of exploitation of migrant workers, and the discourse of racism. Abbugao, M., 2011. Singapore Vote a ‘Wake Up Call’ for Ruling Party. MySinchew.com, [online]. Available at: http://www.mysinchew.com/node/62864/html [Accessed 17 September 2011]. Abraham, L., 2002. Bhai-behen, True Love, Time Pass: Friendship and Sexual Partners Among Youth in an Indian Metropolis. Culture, Health and Sexuality, 4(3), pp. 337-353. Appadurai, A., 1990. Disjuncture and Difference in the Global Culture Economy. Theory, Culture, and Society. 7, pp. 295-310. Au, J. Y. Lee, L. and Lin, K., 2007. Crossing the Them-and-Us Divide. The Straits Times, [online]. Available at: http://www.asiaone.com/print/Business/Office/Ask/Story/A1Story20071114-36582.html [Accessed 15 March 2011]. Casetti, F., 2009. The Filmic Experience. Screen, 50(1), pp. 55-66. Chakrabarty, D., 1999. Adda, Calcutta: Dwelling in Modernity. Public Culture, 11(1), pp. 109-145. Cronin, R., 1989. Imagining India. London: MacMillan Press. Cunningham, S. and Sinclair, J., eds., 2000. Floating Lives: The Media and Asian Diasporas. Brisbane: University of Queensland Press. de Certeau, M., 1984. The Practice of Everyday Life. Translated from French by Steven Rendall. Berkeley: University of California Press. Deleuze, G. and Guattari, F., 1987. A Thousand Plateaus: Capitalism and Schizophrenia. Translated from French by Brian Massumi. Minneapolis: University of Minnesota Press. Ezra, E. and Rowden, T. eds., 2006. Transnational Cinema: The Film Reader. London and New York: Routledge. Foucault, M., 1997. Society Must Be Defended: Lectures at the Collège de France 1975-1976. New York: Picador. Fuller, M., 2005. Media Ecologies: Materialist Energies in Art and Technoculture. Cambridge: MIT Press. Gillespie, M., 1995. Television, Ethnicity and Cultural Change. London and New York: Routledge. Grosz, E., 1994. A Thousand Tiny Sexes: Feminism and Rhizomatics. In: C. V. Boundas and D. Olkowski, eds., Gilles Deleuze and the Theater of Philosophy, New York: Routledge, pp. 187-210. Hall, S. et al., 1978. Policing the Crisis: Mugging, the State and Law and Order. London: Macmillan Education. Harbord, J., 2007. The Evolution of Film: Rethinking Film Studies. Cambridge: Polity. Jeffrey, C., 2010. Timepass: Youth, Class and Time Among Unemployed Young Men in India. American Ethnologist, 37(3), pp. 465-481. Kennedy, B., 2000. Deleuze and Cinema: The Aesthetics of Sensation. Edinburgh: Edinburgh University Press. Kok. M. and Sim, M., 2010. More India Nationals Moving In. The Straits Times, [online]. Available at: http://www.160.96.186.100/lib/pdf/2010/Jul/ST2013.pdf [Accessed 14 August 2011]. Lefebvre, H., 1991. The Production of Space. Translated from French by Donald Nicholson-Smith. Oxford: Basil Blackwell. Leow, G., 2008. The Best Things in Life are Free. Timeout Singapore, [online]. Available at: http://www.timeoutsingapore.com/rojak/feature/the-best-things-in-life-are-free [Accessed 16 August 2011]. Mishra, V., 2002. Bollywood Cinema: Temples of Desire. London and New York: Routledge. Mr biao, 2007. Too many foreign workers in Singapore! Tomorrow, [online]. Available at: http://goo.gl/Cdcdb [Accessed 06 January 2011]. Rahman, N. A., 2008. Migrant Workers in Singapore Workforce: Managing Flows and Challenges, [online]. Available at: http://www.twc2.org.sg/site/images/stories/MWs%20in%20Spore%20Workforce_paper%20by%20Noor.pdf [Accessed 18 August 2011]. Rahman, N. A., 2010. Managing Labour Flows: Foreign Talent, Foreign Workers and Domestic Help. In: T. Chong, ed., Management of Success: Singapore Revisited. Singapore: Institute of Southeast Asian Studies, pp. 199-216. Rai, A., 2009. Untimely Bollywood: Globalization and India’s New Media Assemblage. Durham: Duke University Press. Rajagopal, A., 2001. Politics After Television: Hindu Nationalism and the Public in India. Cambridge: Cambridge University Press. Rothe, D. and Muzzatti, S., 2004. Enemies Everywhere: Terrorism, moral panic, and US civil society. Critical Criminology, 12(3), pp. 327-350. Sandhu, K. S., 1993. Indian immigration and settlement in Singapore. In: K. S. Sandhu and A. Mani, eds., Indian communities in Southeast Asia. Singapore: Institute of Southeast Asian Studies, pp. 774-787. Sarkar, M., 2009. Bonded migration: Bangladeshi workers in temporary contract work in Singapore. Third Critical Studies Conference on Empire and Migration, [online]. Available at: www.mcrg.ac.in/T_C_Conference/Mahua.doc [Accessed 15 June 2011]. Siddique, S. and Purushotam, N.P., 1982. Singapore’ s Little India: Past, Present and Future. Singapore: Institute of Policy Studies. Simpson, C. Murawska, R. and Lambert, A. eds., 2009. Diasporas of Australian cinema. Bristol: Intellect. Singh, B., 2003. The Problem. Seminar 525, [online]. Available at: http://www.india-seminar.com/2003/525/525%20the%20problem.htm [Accessed 11 December 2009]. van Grunsven, L., 2011. Post-Industrialism and Residencing ‘New Migration’ in Singapore. In: Wong, T. C. and Riggs, J. eds., Asian Cities, Migrant Labour and Contested Spaces. London and New York: Routledge, pp. 66-90. Vasudevan, R., 2003. Cinema in Urban Space. Seminar, 525, [online]. Available at: http://www.india-seminar.com/2003/525/525%20ravi%20vasudevan.htm [Accessed 12 December 2009]. Yeo, E., 2004. Media-South-East-Asia: Imaging of Migrants Often Negative – Critics. Inter Press Service News Agency, [online]. Available at: http://www.ipsnews.net/africa/interna.asp?idnews=26688 [Accessed 06 January 2011]. Yeoh, B., 2004. Cosmopolitanism and its Exclusions in Singapore. Urban Studies, 41(12), pp. 2431-2445. Yeoh, B., 2007. Singapore: Hungry for Foreign Workers at All Skill Levels, Migration Information Source, [online]. Available at: http://www.migrationinformation.org/Profiles/display.cfm?ID=570 [Accessed 12 December 2010]. Yeoh, B. and Chang, T.C., 2001. Globalising Singapore: Debating Transnational Flows in the City. Urban Studies, 38, pp. 1025-1044. I would like to extend my deepest gratitude to the various participants of this project, particularly the Tamil migrant workers who shared their screen encounters, which I detail here. The field research was made possible by the award of a Senior Research Fellowship with the Asia Research Institute, National University of Singapore. I wish to thank Professor Chua Beng Huat and the rest of the Cultural Studies in Asia Research Cluster collective for the many conversations relating to the research project. And finally, my thanks to Anne Begg for her editorial assistance. ‘Specific data detailing the breakdown of the foreign workforce in higher end and lower end jobs are rather elusive. More recently, to placate unsettling perceptions that more than half (61 per cent) of new jobs created in 2007 went to foreigners, the Ministry of Manpower (MOM) released a more detailed breakdown of employment figures based on statistics compiled for 2006. In a report published on its website, MOM revealed that by the end of 2006, foreigners constituted almost half (45 per cent) of the manufacturing workforce and 61 per cent of the construction workforce with “many” occupying jobs that are unpopular with Singaporeans because of demanding work conditions such as long hours of shift work and working in a clean room environment. By far, data reported in a Straits Times article published in November 2007 is the most detailed in providing a breakdown of the foreign workforce in terms of skill levels. The article reported that out of a total population of 756,000 working foreigners in Singapore in 2006, 646,000 are work-permit holders who are engaged in unskilled and lowly skilled manual jobs in various sectors. The remaining 110,000 are Employment Pass and S Pass holders who have recognized skills or professional qualifications and earn a monthly salary that is equal or more than $1,800’ (Rahman, 2008). A welter of studies have identified the relationship between cinema and migrant communities in terms of the engagement with, and fostering of, transnational social relations and to which the responses from the workers can be connected. Marie Gillespie’s Television Ethnicity and Cultural Change (1995), Elizabeth Ezra and Terry Rowden’s 2006 volume Transnational Cinema: The Film reader, Catherine Simpson, et al’s Diasporas of Australian Cinema (2009), and Stuart Cunningham and John Sinclair’s Floating Lives: The Media and Asian Diasporas (2000) are just a few amongst a larger scholarly corpus that links cinema, television — the screen — to “the formation and transformation of identity” (Gillespie 1995, p. 1). While I focus on the use of screens in the Dormitories and the Recreation Centres, I should add that the free open-air screenings of the latest Tamil and Hindi films in an open field in Little India on Sundays to attract South Asian workers is another instance of the use of screens as a biopolitical technology. This initiative is organised by SCAL and sponsored by M1, the government’s Telco subsidiary. I have no space here to discuss this development in detail, but the initiative is well captured by Leow (2008) who writes: “Want to see what Woodstock would’ve looked like if it involved film? Then get thee to the open plot of land at the junction of Weld Road and Sungei Road every Sunday evening. There, you’ll find Hindi movies projected on to a huge white screen and speakers blaring out the bhangra — an alfresco Bollywood spectacle, if there ever was one. … [A] market accompanies the film screening as well to cater to thousands of Indian foreign workers. It all might be a bit intimidating for some, but dare to go there, curious cats – it’s a scene like no other”. Similar to the use of screens in the Dormitories and Recreation Centres, this initiative functions to regulate the movement and visibility of migrant workers. The notion of killing draws from Foucault’s account of the sovereign right to kill. As he says, “when I say ‘killing’ I obviously do not mean simply murder as such, but also every form of indirect murder: the fact of exposing someone to death, increasing the risk of death for some people, or quite simply, political death, expulsion, rejection, and so on” (1997, p. 256).